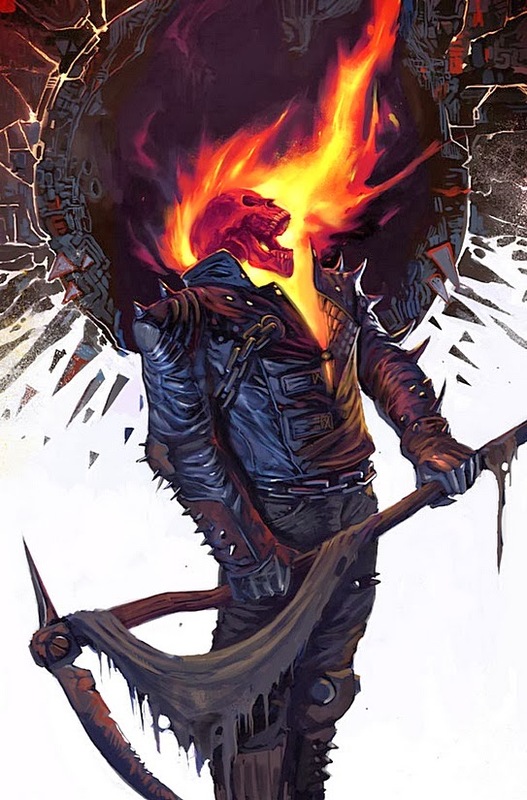 The main weapon in Ghost Rider's supernatural arsenal is his 'Penance Stare'. By looking into the eyes of the evil, he can make them relive the pain of their victims, compacted into seconds of hell. Now at least two fans can prove they can take similar pain head on, having each had full colour back tattoos of the free-wheeling demon etched into their skin. 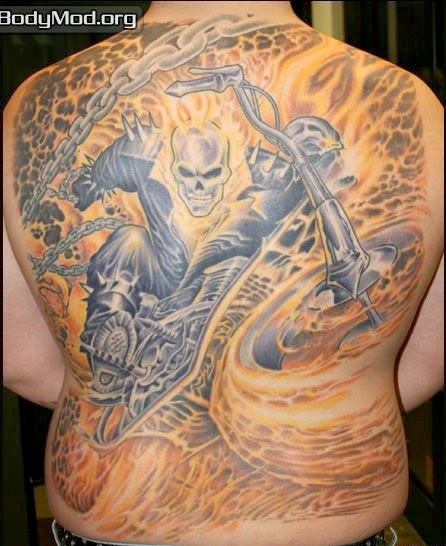 See, I'd sit in the chair wanting Ghost Rider, but when the needle starts humming, I'd want the Invisible Woman. Who's a chicken? Not this guy, he too went the full monty. 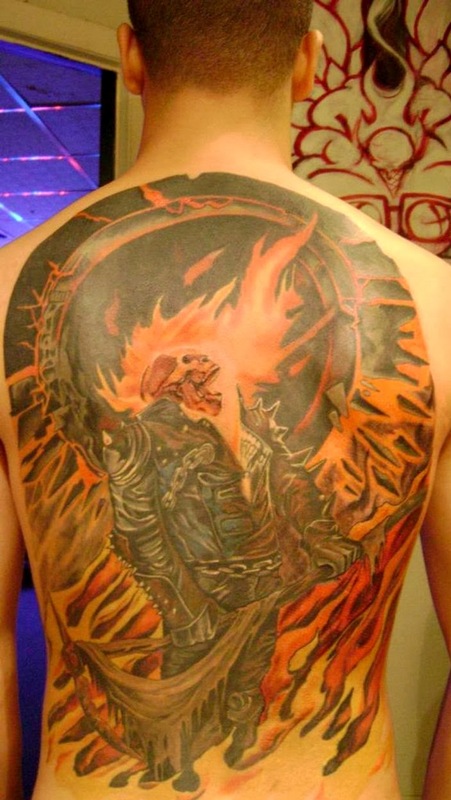 I wonder if Silvestri, or in this guy's case Marko Djurdjevic, ever see their professional artwork emblazoned permanently on flesh like this and what a tribute it must feel like to have fans that think that highly of your art. Sure this guy took a little artistic license with the flames etc, but they don't look out of place. In fact if you never saw the original you wouldn't even know. 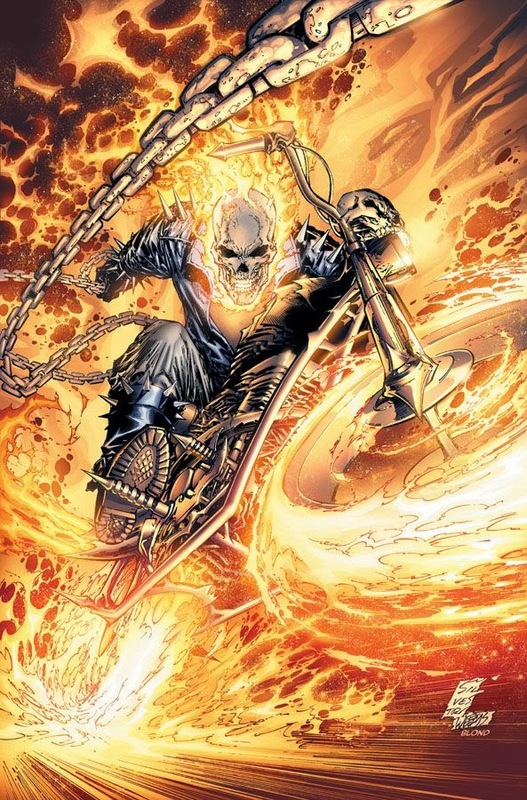 I guess that's the thing about Ghost Rider too. Comic fans will know the character instantly, but to Joe Public, who may have escaped the last two movies, tattoos like these would seem just standard (yet incredibly done) ink-art fare. Wow! Now those are truly tatoos, and truly true-blooded fans to get that exensive work done. So can we sign you up for the chair yet mate? Joker perhaps or Bane? Nice one Mr - two hellish puns in one reply ;) I'm good - I actually came across these brave dudes looking for ideas for my own G.R. tattoo, but after seeing these, I think I'm more a Silver Surfer than a spirit of vengeance! Joker yeah sure. Actually considering that. Don't know which, other than one of maybe one I saw where the Batman symbol seamlessly transforms into a series of the Joker's trademark HA HA's. That would be pretty cool. Clowns are one of the world's key phobias, and I think Joker is an unsung part of that ranking!